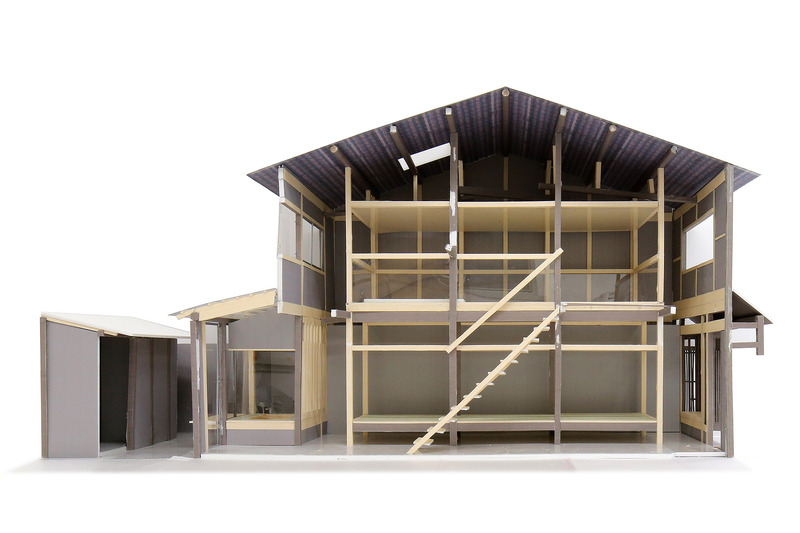 This is a plan to remodel a semi-detached wooden townhouse. The house is located in the quiet grid-shaped area which has made up the town landscape of Kyoto since olden days. The site has a well-preserved hierarchal floor plan containing a shop area, kitchen, tatami rooms and rear garden positioned alongside tori-niwa (passage garden). This passage allows the bustling atmosphere of the town to permeate the house. This roadside townhouse is not separated from town by a single front door, but its entire area adjoins the town though its tori-niwa, which functions as a front garden, entranceway and service yard while diluting the outside environment. 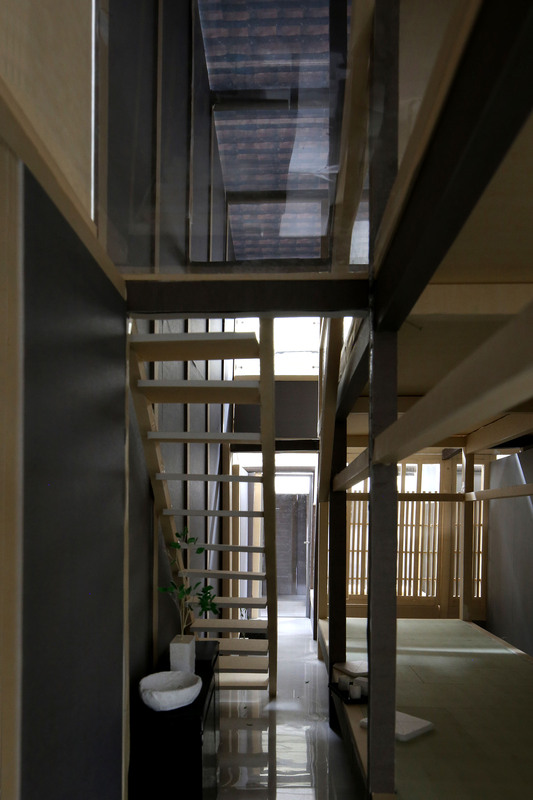 We envisioned a building in keeping with modern living, in which a tori-niwa stretches under the entire periphery of the large existing roof, enhancing the townhouse through further opening it to the town. The space under a lean-to shed which is detached sectionally by the newly installed peripheral void became an airy bathroom between the rear- and passage garden. Along the now doubled boundary between the earthen floor of the tori-niwa and raised floor spaces, there is continuous activity and movement centered on items such as chairs, tables and beds. 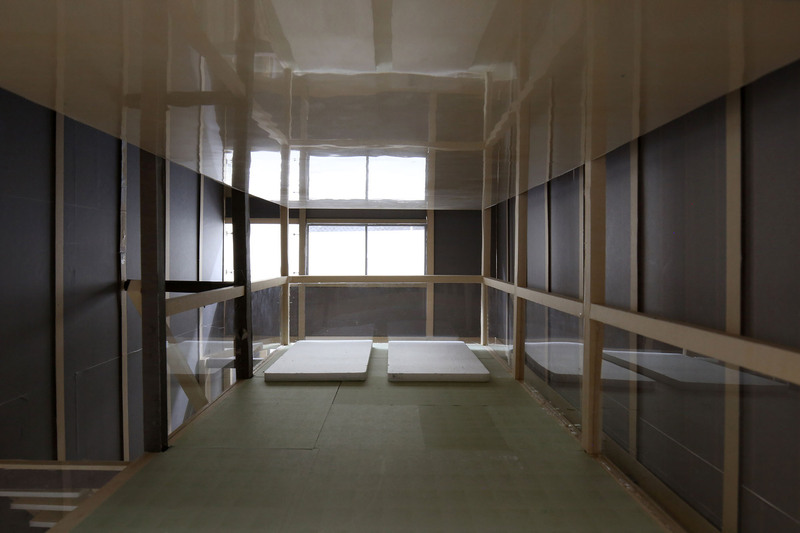 Though connecting the previously divided 4.5 and 6 tatami mat area rooms into one long space and placing furniture in the tori-niwa, we have created a flexible and graduated way to utilize the space round raised floor areas. The upper atrium void disappears into darkness just a few maters above the ground, producing a strange sense of quietness. The bedroom on the second floor is separated from the outer wall by the surrounding atrim - this is a special rooms in which one can sense the entire house. A soft light shines in through the atrium from the windows, giving one a feeling of openness and security as if standing on top of a tower.